Here, at InfoSmush I’ve reviewed many apps with which you can make money online. But Slidejoy, the app I am reviewing today is different from all of them. Slidejoy is the best unlock and earn app that I have ever used. And I’m still using this app because it pays me for just unlocking my phone. So, it is tested by me and this Slidejoy review is based on my personal experience. Like I said earlier, Slidejoy is an ‘Unlock and Earn’ app available only on Android. Slidejoy will show ads on your lock screen and you will be paid to just have them on your screen. You don’t have to interact with the ads to get your “Carats”. Carats are their virtual currency which you earn. 1,000 Carat equals to $1. See, how simple it is. You get paid to just view advertisement on your lock screen or should I say you get paid for just using your smartphone. But don’t use your mobile ‘unnaturally’. Don’t keep locking and unlocking your smartphone. It won’t give you more carats rather may get your account banned. Interacting with ads will also be pointless (it won’t give you extra carats). So unless you really want to know more about the ad/sponsor: just unlock. How to use the Slidejoy app? Using Slidejoy is effortless. 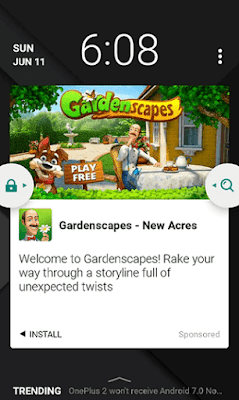 Just download the app from Play Store, complete the short sign up process and enable the Slidejoy screen locker. Now use your phone as you normally do. Left: Swipe left to view the sponsor’s site or download the app on which the ad is. Right: Swipe right to unlock your Smartphone. Up: And finally you can glide your fingers up to view the latest news on almost all topics including tech., sports, and politics. Like I said before interacting with the ads won’t help you earn more. Also, don’t keep locking and unlocking your Smartphone; this may get your account banned. To show ads on your home screen/lock screen Slidejoy needs an internet connection. Therefore, to earn the most from Slidejoy keep your data connection on except when you are running out of battery. In such a case, you can force close Slidejoy or disable Slidejoy locker by going to setting from the three-dot menu on the lock screen. You can earn from $1 to $2 a month just by using Slidejoy screen lock. 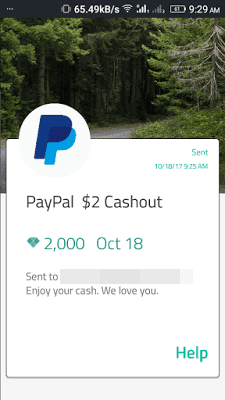 Other than viewing ads on your lock screen you can also earn by completing offers and surveys which are provided by some trusted companies like Supersonic, NativeX, Fyber, TrialPay, Cint Surveys, Adsend Media and Peanut Labs. These offers and surveys will help you earn more carats and get your first payout faster. But, it pretty much destroys the basic concept of this app, which is: get paid for doing nothing. But, you can earn by completing offers and surveys in your spare time. You can exchange your carats for PayPal cash, Facebook, 1-800-followers, Hotels.com Gift Cards and Top up Recharge. You can top up your mobile from Rs. 25(462 carats) to Rs. 100(1,870). 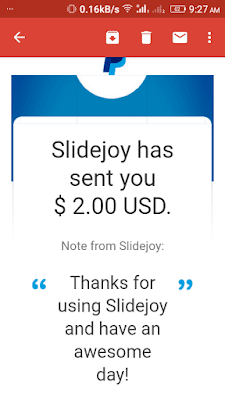 Slidejoy is one of the most rewarding apps that I use to earn some extra cash with my Smartphone. 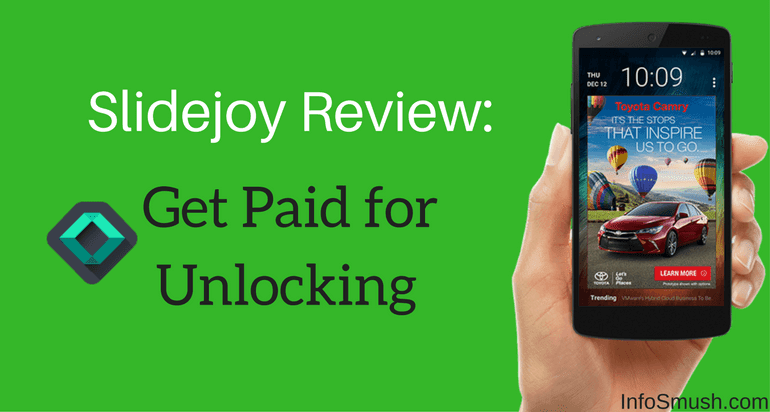 The thing I liked the most about Slidejoy is that I’m getting paid for practically nothing. Slidejoy is one of the few apps that I've reviewed and not mentioned any cons. You just have to view (actually, you don’t even have to look at the ads. 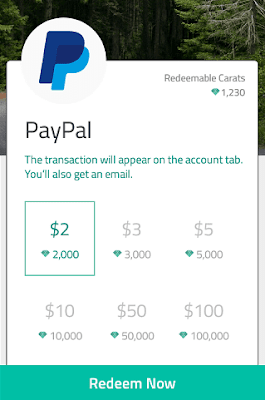 No need to interact at all) to be eligible to get your carats. You can also speed up your earnings by offers and surveys.